Leave 3 leafs of gelatine to soak in cold water for at least 10 minutes. Whisk 3,5 decilitre whipping cream with 50 grams of sugar. Chop the 150 grams of white chocolate finely. Heat 1,5 decilitre of whipping cream in a pan and make the chopped white chocolate melt in it. Take the pan of the heat and put the gelatine in it (after having it squeezed out). Then carefully mix it with the whipped cream. Cut the cake into slices and cover the bottom of the cake tin. Fill the cake tin with the mousse and put it in the freezer (for about a night), so it gets frozen. Leave 3 leafs of gelatine to soak in cold water for at least 10 minutes. Bring 1 decilitre whipping cream, 1,4 decilitre water, 180 grams of sugar, and 60 grams of cocoa powder to the boil in a pan. Boil this down to half its volume in about 2 minutes. Take the pan of the heat, put the gelatine in it (after having it squeezed out), and mix it together. Take the cake out of the freezer and remove the cake tin. 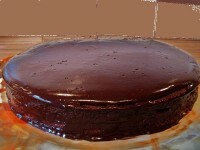 Then pour the frosting (after it has cooled down a little) over the cake and thaw out the chocolate cake. Yum-yum! PS: in the mood for some more cooking? Play here some cooking games! Molten Lava Chocolate Cake RecipeBecause so many people love mint ctclooahe lava cake, we’ve included a variation with this recipe. * 8 ounces semisweet or bittersweet ctclooahe, chopped * 4 large eggs * bd pound (2 sticks) unsalted butter, chopped * 4 tablespoons unbleached all- purpose flour * bd cup sugar * 1 teaspoon ground nutmeg* * bd teaspoon ground cinnamon—or for a mint version, substitute 1bc teaspoons peppermint extract for the cinnamon * Whipped cream for garnish (1 pint heavy cream, confectioners’ sugar and vanilla extract) * Raspberries and mint leaves for garnish (optional)*We use a nutmeg grinder and a fresh nut; you also can use the nut with a plane grater.Preheat the oven to 350b0F. Grease eight 4-ounce cake molds or ramekins.Over a double boiler, melt the ctclooahe and butter, stirring constantly. Once they are completely melted, set aside and cool.Combine the sugar and eggs and whisk until pale and fluffy. Stir the ctclooahe mixture into the egg mixture until completely blended. Whisk in the flour, nutmeg and cinnamon and mix well. Pour the batter into the cake molds and bake for 14 minutes at 350b0F. While the cakes are baking you can whip the cream. To one pint heavy cream add 2 tablespoons confectioners’ sugar as the cream begins to thicken, plus 1 teaspoon vanilla and a few grains salt. Unsweetened or barely-sweetened whipped cream is also delicious, so feel free to reduce the sugar or add none at all.Remove the lava cakes from the oven and cool for 2 minutes. Run a knife around the edges, invert the molds onto individual dessert plates, garnish with raspberries and mint leaves and serve immediately. We prefer to pass the whipped cream in a bowl so guests can help themselves to the amount they prefer.